Pretty cool photo of the space shuttle Atlantis, eh? Just a piece of trivia: Like all astronauts, those on this shuttle can’t burp in space because there is no gravity to separate liquid from gas in their stomachs. Astronauts on the space shuttle Atlantis were preparing to begin the second of five spacewalks yesterday to repair the Hubble Space Telescope, after successfully fitting it with a new camera and computer on Thursday. At 1.16pm BST yesterday, Mike Good and Mike Massimino will leave the shuttle to install six new gyroscopes and change its batteries. The spacewalk was expected to last six and a half hours. On Thursday, John Grunsfeld and Drew Feustel replaced the telescope’s Wide Field and Planetary Camera-2 with the more versatile Wide Field Camera-3. Their efforts were delayed by a stuck bolt, which took Feustel 45 minutes to remove. 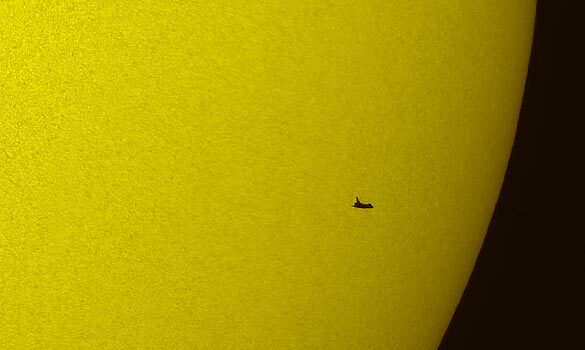 A dramatic photograph released by Nasa has also captured Atlantis en route to Hubble, in silhouette against the Sun. The image was taken from the ground on Tuesday using a telescope with a solar filter. Thursday’s first day-long space walk combined moments of light-hearted exuberance — exclamations of “woo-hoo”, “fantastic” and “too cool” as Feustel and Grunsfeld, gazed at the Earth 350 miles (563km) below — with nailbiting tension as they tried to fit the new camera. As the bolt resisted subtle attempts to free it using power tools, the astronaut was given permission from mission control to resort to force. “I want you to understand that if this breaks, wide field stays in,” Feustel warned, raising the prospect that if the bolt snapped, the ailing camera would remain in place and its $126 million (£82 million) replacement would be brought back unused. This entry was posted in News, Who Knew?. Bookmark the permalink. How can one look at this and not believe in a higher Creator? Awesome!